Houdini's adopted hometown of Appleton, Wisconsin held their annual "Houdini 10K" run on Saturday. The run started at at Houdini Plaza in Downtown and ended at Houdini’s Escape Gastropub. Below is this year's finishers medal. 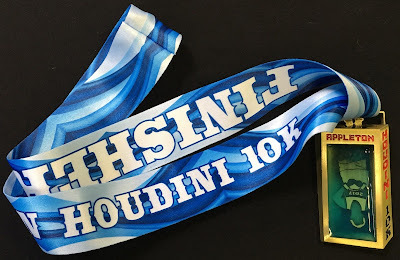 To see photos from Appleton's Houdini 10K and for more information, check out their official Facebook page.